Before you even know you are pregnant, the yolk sac has already formed and giving your growing little bean the nourishment it needs. This is only a temporary source of nourishment until the placenta takes over. The sac of pregnancy on ultrasound is usually the first sign that can confirm an actual pregnancy. You may have also heard this referred to as the “gestational sac” and it shows up if you have a very early ultrasound. It looks like a bright white ring around a dark center and you may even see a little spot in it where the embryo is forming. When Can You See the Sac of Pregnancy on Ultrasound? Early Gestational Sac – This is the first indication of pregnancy and appears between the 4th and 5th week on transvaginal ultrasound or around the 7th week on external ultrasound. It has a white rim with a clear center and early on does not show any other structures. Measurements can be taken of the sac and it tends to grow about 1mm per day until the pregnancy is around 9 weeks along. 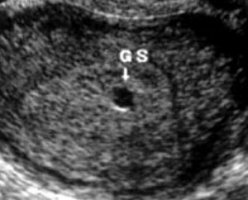 Even if there is an ectopic pregnancy, they can still see a gestational sac in the uterus. The size of the sac can give an approximate age of the pregnancy when compared to last menstrual period and Hcg measurements in the blood. 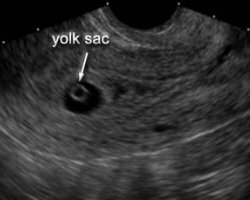 Yolk Sac of Pregnancy – The next sac of pregnancy on ultrasound is the yolk sac. These show up as a round sac with a white circle around it that is very bright. It shows up at 5 weeks and never gets any bigger than 6 mm in size. If they do grow larger, there may be an issue with the pregnancy. If the gestational sac reaches around 12 mm in size and no yolk sac is identified, there may be a problem with the pregnancy. If the yolk sac does not appear clear, there may be an issue. What If I Can’t See the Yolk Sac? It is possible that if there is no sac of pregnancy on ultrasound, there is no pregnancy and other test results could have been false readings. There is also a chance there is a miscarriage in progress. The good news is most often it is just too early to see the yolk sac and the pregnancy will progress just fine. The yolk sac on ultrasound is visible about five and a half weeks into the pregnancy. 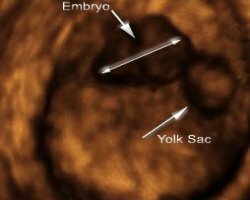 If there is no visible yolk sac, the pregnancy may not be as far along as you thought. This can happen if you can’t correctly remember the first day of your last period or your periods are irregular. If you aren’t sure of your dates and there is no pregnancy sac, the doctor may have you go in for a follow-up ultrasound in a few weeks. There is almost always a fetal pole that shows up during that time. If a follow-up ultrasound still doesn’t show a yolk sac, you will most likely be diagnosed with a miscarriage. One of the complications could be a miscarriage that has not yet happened. This is known as a “missed abortion” and pregnancy tests will be positive, but there isn’t a visible gestational sac. The sac could be present, but there is an abnormality with the size of the yolk sac. If there is bleeding in early pregnancy and the ultrasound is abnormal, this may be a threatened abortion or a miscarriage already in progress. If the doctor sees a normal gestational sac, normal yolk sac and fetal heartbeat then there is a 5% chance the pregnancy is normal. If there is no gestational sac and active bleeding, a miscarriage may have already occurred and there are products of conception will in the uterus. In this case, the doctor may have to do a D and C to clean the uterus out. hCG Levels – This hormone level rises continuously in the blood in early pregnancy. If any of the above conditions are suspected, they can be checked every few days since they increase every 48 to 72 hours. A level that has dropped can signal a miscarriage. Progesterone Levels – In early pregnancy, the follicle that released the egg secretes progesterone to maintain the pregnancy until the placenta has fully formed. If there are low progesterone levels, miscarriage can occur. When Should I Stop Sleeping on My Stomach? When Will First Period Come After Miscarriage and What It’s Like?